EL310631 - Steampunk Cybersteam Eyepatch - Gold & Orange. Costume suggestions: steampunk, cyberpunk. Airship pilots, motorcycle bandits, or even a well established politician in the community are all characters we can think of that this item would be a perfect steampunk accessory Adjustable elastic strap. Fits adults and kids 12 and up Great for Steampunk, Cyberpunk, and other alternative realities, or Turn of the Century or World War I era pilots. Great Steampunk, Mad Scientist, Aviator, Victorian Eccentric Inventor Goggles. Costume suggestions: steampunk, cyberpunk. Adjustable elastic strap. Fits adults and kids 12 and up. Whether you are modulating your steam engine or battling evil barons piloting larger-than-life mechanical beasts, be sure to exhibit true gentleman's form and don your goggles for the ultimate in steampunk guise. Join the retro-future world of Steampunk, with this Monovision Gold and Orange Eye Patch! Inspired by a melding of Victorian-era Britain and the fantastical designs of authors like H.G. Wells and Jules Verne, this goggle eye patch is the perfect addition to your steampunk costume! 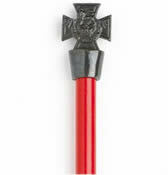 Measures about 2-inches in diameter. Ages 14 and up. Airship pilots, motorcycle bandits, or even a well established politician in the community are all characters we can think of that this item would be a perfect steampunk accessory for. So wherever your steampunk fantasy takes you, we think you'd be doing yourself a disservice to not think about this single monocle style goggle for your costume. While it might not necessarily be a pair of steampunk goggles, these monivision eye patches can definitely add to your steampunk costume. These single eye goggles, as we like to call them, come with an adjustable strap and as you can see in the picture below, are the perfect finishing touch to an already perfect outfit. We have these items available in both Gold and Silver; this one is gold with an orange lens - see our other items for the silver version. It will go with just about any steampunk costume you can dream up. Inspired by a melding of Victorian-era Britain and the fantastical designs of authors like H.G. 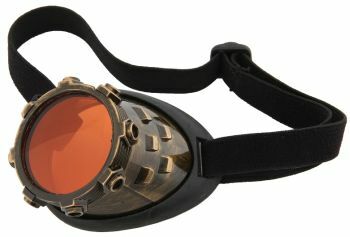 Wells and Jules Verne, these goggles are the perfect accessory for your steampunk costume. CyberSteam Gold Eyepatch. Ok, it might not really be a set of Goggles in the same way as the others, but this eye patch is just too cool! Easily add to almost any steampunk costume you can dream up, which is why its number two on our list!